Memory Foam One of the fads in footwear is a memory foam insert. One of the fads in footwear is a memory foam insert. I see many people with these types of inserts. I also see many people coming in with complaints of pain in their feet as well due to these inserts. Why? The answer has to do with the support or firmness of the inserts. Memory foam is soft and easily deforms. This allows the foot motion to be increased in the shoe due to the lack of stability. These inserts feel great when you first put them on but if used for long periods of time will lead to foot fatigue and likely plantar fasciitis and possibly tendinitis. Shoe inserts need to have some stability or firmness to them to be able to cradle your foot. 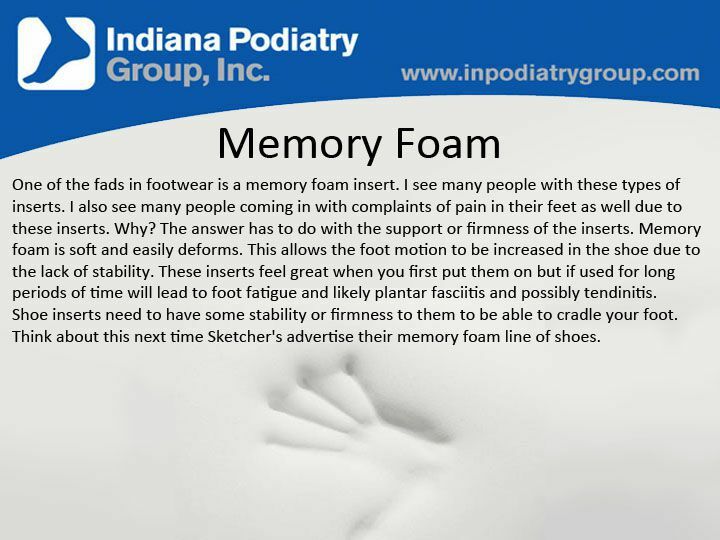 Think about this next time Sketcher's advertise their memory foam line of shoes.